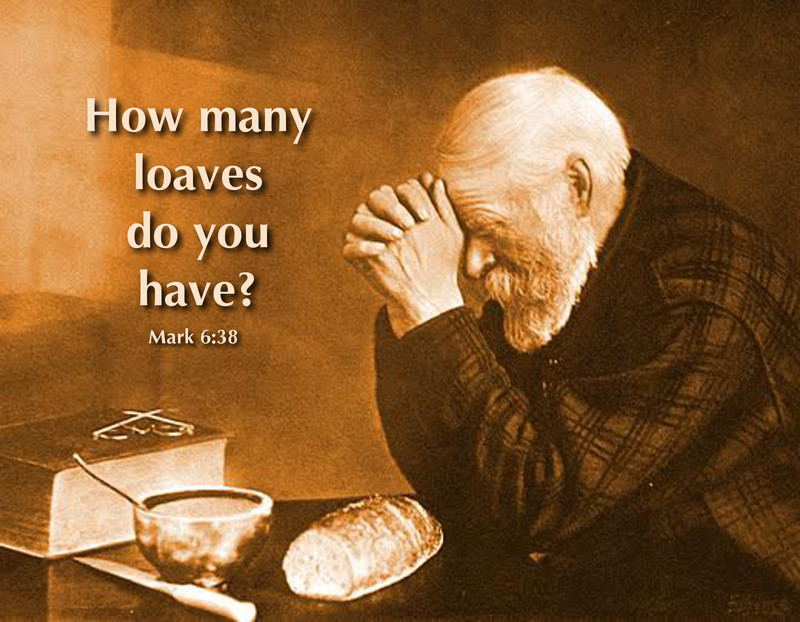 The girl points to the painting in the living room and asks, “What is the man doing?” Her grandmother explains, “He folds his hands in prayer and gives thanks to God for the bread on the table.” The girl wants to know, “Why? We’ve got lots!” Her answer is telling; she has not experienced want or hunger—unlike her grandmother, who was a refugee at the end of World War II. When Jesus saw the hungry crowd, he told his disciples, “You give them to eat.” Remarkable words! Jesus had confidence in his disciples. But they thought they couldn’t do it. After Jesus blessed the bread and fish, the disciples gave the food to the crowd. They all ate their fill—and there were leftovers! Bread is a very basic food item. Bread is the Jesus-theme. Jesus was born in Bethlehem, which means “House of Bread.” He is the “Bread of Life.” He teaches us to pray for our daily bread. At the Table, he gives us a foretaste of the feast that is to come. In the meantime, we have got a job to do: Jesus asks us to “feed them.” Why? Because we’ve got lots! Prayer: Lord Jesus, we give you thanks that you feed us in body, mind, and spirit and that you equip us to feed the hungry.